This is a copy of an article in the Canterbury Herald of 15th August 1908, concerning an alleged offence of ‘obstruction’ outside the Duke of Cumberland Public House in Whitstable. Before: Lieut-Col. S. Newton Dickenson (in the chair), Mr. W.A. Lochee, Mr. F.J. Godden, Mr. F.H. Wilbee, Mr. A.A. Kemp, Mr. J. Hogson and Mr. C.A. Tilley. CASES OF OBSTRUCTION FROM WHITSTABLE - STREET PREACHERS NOMINALLY FINED. Sidney Herbert Osborne was summoned for obstructing the highway at the Cross, Whitstable on July 26th. Mr. S. Shea, of Margate, appeared for the defendant. By Mr. Shea: He knew Whitstable well. The road was 40ft 6ins at the widest part from kerb to kerb. The town band had played there, and the Salvation Army had held meetings there. He had had to have a man to keep the roads clear. The crowds seemed to get bigger. He had had complaints of the meetings and these proceedings were taken. Did you ever tell the defendant that they were breaking the law? - They were cautioned on the 21st. The defendant, with other people, came on the highway and created an obstruction. You were on the pavement and deliberately allowed that obstruction to go on? - I did the best I could and endeavoured to keep the pavement and the road clear. You deliberately wanted to make a case against them? - No, sir, I did not. Why did you not tell the defendant to desist? - I had told them on the 21st. Although you knew an offence was being committed you did not deem it necessary to call their attention to it? - Their attention had been called to it before. I thought it was useless - and it would have been useless. Did the foot passengers make any complaint to you? - No, but they had to get out into the road. Was there any disorder? - No. It was a properly conducted outdoor religious service? - Yes. And you have seen services conducted there during the last three years? - Yes. And they have a meritorious object, don’t they? - Yes. And if it is an offence it is a highly technical one? - No, I should think it is serious at that position. It has suddenly developed seriousness after three years. Two of the defendant’s colleagues were keeping the road clear? - I only saw one. The Chairman: It is stated that it was a technical offence. Was it to the inconvenience of the general public? - That is my opinion. PC Burgess gave corroborative evidence. Mr. Shea said he thought the police had been pushed into taking these proceedings. He could not do anything better than refer them to the dissertation in “Stone’s Justices’ Manual”, where it said that there could be little doubt that meetings in the streets for religious worship would be excluded on account of the excellence of the objects in view if they were conducted with decency and order, and held at reasonable hours and ordinary times when there was nothing to render the meetings objectionable provided there was no ordinary obstruction. It could not be disputed that those meetings were held with a very meritorious idea. They were held for the purpose of reaching people who either owing to their employment or other means were unable to attend an ordinary place of worship. 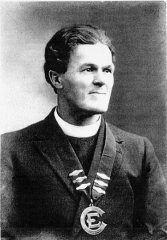 The meetings had been held there, so he understood, in the case of the Salvation Army for 23 years, and the present defendant and his colleagues for two or three years, and the police up to the present time had raised no objection. One sect had held meetings there for over 150 years. Such meetings were held in every city, town and village in the United Kingdom, and the amount of good they did was known to everybody. “If conducted with decency and order” - he would refer them to the statement made by the constable and the Police Sergeant in cross-examination. They stated they were conducted with order, and it was a proper meeting, and no disorder. It was an ordinary religious out-of-doors service. It was held at reasonable hours - from eight to nine o’clock on a Sunday evening, at a suitable place. It was the best public place in Whitstable. They had the Salvation Army and the town bands playing there, and it was a square for public meetings and public assembly. The only other point was the question whether there had been any obstruction to the ordinary traffic of the street. If the meetings were held on an ordinary week-day, he would not be addressing them, because he would say that the amount of traffic one expected to find at Whitstable on week-days would be considerable, and there was no doubt that holding meetings on a week-day would obstruct traffic. There was no business going on in those little seaside towns on a Sunday. He turned to the evidence of the sergeant, who told them that all he saw was two cyclists who got off their machines. Two members of the congregation assisted in preventing any possible obstruction. He submitted that there was no obstruction considering the time and place of the meeting under the section of the Highways Act, under which the proceedings were taken. The police were in an unpleasant position, and practically asked to interfere with the right of holding public religious services on Sunday evenings in Whitstable. These services had been going on for years past. No one had ever objected, and all the same, the Bench were asked to do an act which would undoubtedly have the effect of putting an end to the meritorious work of the defendant and other young men associated with him. He asked them to consider what the effect of that would be. The defendant was then sworn and said that his name was Sidney Herbert Osborne and that he was secretary of the Baptist Mission. The meetings were re-started last summer, from that time they went back to time immemorial. They were held from eight to nine, and the services were greatly appreciated. They got increased congregations at the churches through the meetings. The place was a very wide one, and he detailed two men to keep the road clear in case of any obstruction. The sergeant had spoken about the meetings. Until recently the service had been held without any hindrance from anyone. By Supt. Heard: Mr. French, the minister, was warned, and he told witness. Fredk. Lewry, 15 West Cliff Grove, an ironmonger’s assistant, said he attended the meeting and kept the road clear on the Harbour Street side so that a vehicle could have passed at any time. By Mr. Heard: He saw the cyclists get off their machines but there was no necessity for them to do so. Fredk. Pearce, of Marmion Terrace, another member of the community, said he kept the road clear on the Horsebridge side. There was plenty of room for people to move about. John Kemp, of Nelson Road, in no way connected with the community, said he attended the meeting but saw no serious obstruction. He had never seen a better-organised meeting. There was plenty of room for people to get about. The stewards connected with the meeting did better service than the police in conducting the meeting. Roland Nicholls, of Cromwell Road, said he was present at the Cross, and saw the meeting. Mr. Pearce asked him to stand close to keep the road clear, and he did so. Mr. Shea handed in a petition with 500 names, and Supt. Heard said he also had one on his side. The magistrates decided not to take the petitions into consideration. The Chairman, addressing the defendant after the Bench had made a short retirement, said they had considered the case absolutely without reference to anything except the question whether the highway was obstructed or not. The defendant’s motives were correct and praiseworthy but, after the evidence they had heard, it was their duty to balance that evidence, and they had come to the conclusion that there had been an obstruction of the highway, taking all the circumstances into consideration, but at the same time they were of the opinion that in that particular case, it was a very small obstruction, and they had decided to mark their opinion by fining him one farthing (~0.1p), and 12s. 6d. (62½p) costs. A similar summons was then heard against an officer in the Salvation Army named Thomas Trevorrow, who was conducting a meeting on July 26th previous to the meeting complained of in the last case. The defendant pleaded “not guilty”, and was represented by Mr. William Frost, solicitor, of Ranyer, Burton, and Frost, London, who said he was willing to admit the holding of the meeting, and the main features of the case. PS Dengate gave similar evidence to that in the previous case, and said the Salvation Army and other people, between 30 and 40, were being led by the defendant. They formed a ring in the road, and commenced at six pm. The brass band played, and there was also singing and preaching until 6.35pm. There was a large number of people on both sides of the road in the High Street on the pavements. The entrance to Terry’s Lane was completely blocked. He saw several pedestrians obstructed on the pavements. A man kept part of the road clear, which caused more obstructions on the pavement. He saw no vehicles obstructed. As soon as they cleared one part of the pavement the people congregated on the other. In his cross-examination, Sergt. Dengate said he could not dispute that the Salvation Army had held meetings there for the past 23 years. He had had complaints from foot passengers, who had had to step into the roadway. Corroborative evidence was given by PC Ward. Mr. Frost said he thought there was something more behind the case or they would absolutely dismiss such a case without occupying another moment of their time. There had been no obstruction, and only two or three persons had had to step off the pavement. It was absolutely absurd and ridiculous. For 23 years those people had been holding their meetings at that spot without a police complaint or prosecution, and it seemed to him that one was justified in saying a conviction ought not to take place in such a case as that. He had six witnesses who could prove that every effort was made to keep the roadway open. He called Richard Stephen Phillpotts, of Sydenham Street, who said he was present at the meeting, and he thought that no obstruction was caused by the meeting. A “comrade” was told off to keep the road clear. The police stood in the narrowest part of the road and obstructed it. They talked to one another. The Chairman said the Bench came to the same conclusion as in the previous case - a farthing fine and costs. The magistrates had dealt with the case on its merits with reference to that particular meeting, and they had no wish to stop the meetings. If any other cases were brought they would be dealt with on their merits also. Later in the Court Mr. Trevorrow re-appeared and explained that he would not pay the money and asked what the alternative was. The Chairman said a distress warrant would be issued if he had any goods. Mr. Trevorrow said he had no goods. His furniture belonged to the Salvation Army. The Chairman (Mr. Wilbee, Col. Dickenson having left) asked whether he was acting under instructions, or was he doing it of his own accord? Mr. Trevorrow said he was under instructions. The Chairman: It is best to be open with you. We don’t want to make a martyr of you, you know. Why do you object to paying? The Chairman: Well, in default of paying the money you will be sentenced to one day’s imprisonment, which means that you will be released at once. Mr. Osborne: What is the alternative in my case? The Chairman: A distress warrant, so you had better pay. Mr. Osborne thereupon paid his 12s. 6d. (62½p) costs.